Home » Hiking Tips » Hiking Gear Materials » Fleece VS Synthetic Fill Jackets: What to choose? Over the last couple of years, the popularity of fleece jackets has decreased, and many hikers have replaced their fleece apparel with jackets insulated with synthetic fill. While synthetic fill jackets are indeed warmer for the weight and pack smaller, fleece does have certain advantages over synthetic fill. 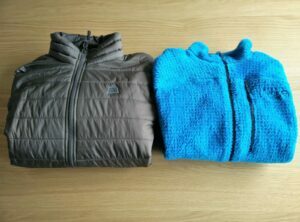 I own a fleece jacket (Mountain Hardwear Monkey Man) as well as a jacket with synthetic fill (CimAlp PrimaLoft), and I decide which one to wear on a given trail after checking the weather forecast and the conditions. Sometimes I go with the CimAlp jacket while other times the Monkey Man is a better option. In this article I will explain the differences between fleece jackets and synthetic fill jackets to help you choose the right garment for your particular needs and adventures. If you are into hiking, backpacking or basically any outdoor sport, you’ve probably already heard that you should use lightweight gear. If not, check out my article Why hike lightweight. In general, fleece does not have as good a weight-to-warmth ratio as synthetic insulation which in simple terms means that a fleece jacket which weighs 400 grams will be less warm than a synthetic jacket of the same weight. 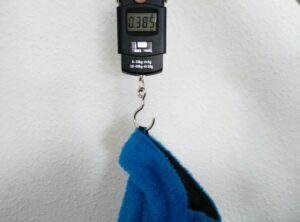 It is, nevertheless, important to keep in mind that there are different qualities of both fleece and synthetic fill insulations, which means that it is indeed likely that a high-quality fleece jacket is warmer than a low-quality synthetic fill jacket. Whether you are buying a fleece jacket or a synthetic fill jacket I recommend sticking to reputable brands which use materials from acknowledged manufacturers such as Polartec for fleece and Primaloft for synthetic fill. Assuming that you get quality products, it is thus safe to say that fleece jackets are best for moderate temperatures in spring and fall because fleece is not as thermally efficient as synthetic fill. Synthetic fill jackets are on the other hand great for very cold conditions in winter, but the thinner ones can also be worn comfortably in spring and fall. It is important that you have breathable garments for hiking as you will otherwise soak in your own sweat. Fleece jackets provide better air permeability than synthetic fill jackets. Synthetic fill jackets consist of three layers – face fabric, insulation and lining. While the synthetic insulation itself is typically not problematic in terms of air permeability, the face fabric and the lining usually are. They are almost always made of tightly woven nylon which decreases the breathability of the garment. Fleece jackets, on the other hand, are often made of very porous synthetic fabrics which provide excellent air permeability (see the image). Therefore, I recommend wearing a fleece jacket for highly aerobic activities at moderate temperatures because fleece jackets provide better breathability. Neither fleece jackets nor synthetic jackets are waterproof, but synthetic fill jackets do provide some protection against rain and wind. As mentioned above, the face fabric of a synthetic fill jacket is usually made of tightly woven nylon which efficiently blocks the wind. 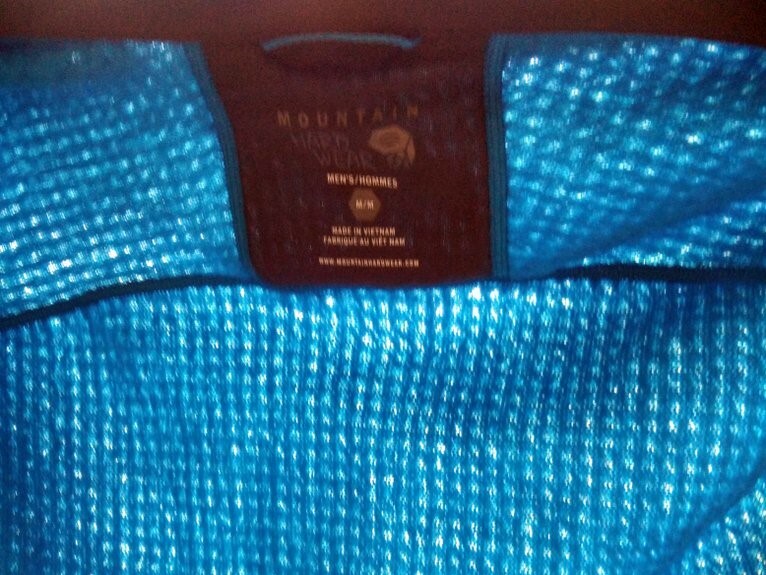 Many manufacturers also treat the face fabric with DWR which enhances the rain resistance. Due to the porous structure of the fabric, fleece jackets do not block the wind or provide protection against rain. 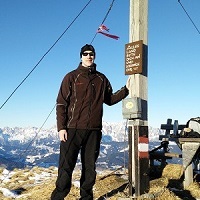 Therefore, a jacket with synthetic fill insulation is a better option for hiking in very windy areas and for snowy conditions (snow showers, snow falling from trees etc.). Be aware, however, that neither garment type is suitable for rainy conditions as it will get soaked sooner rather than later. In case that there is a chance of rain, I always throw my Montane Minimus jacket in the backpack as it packs small and light. I can then wear it over my fleece jacket or synthetic fill jacket (CimAlp Primaloft jacket is very thin) if it comes to precipitation. 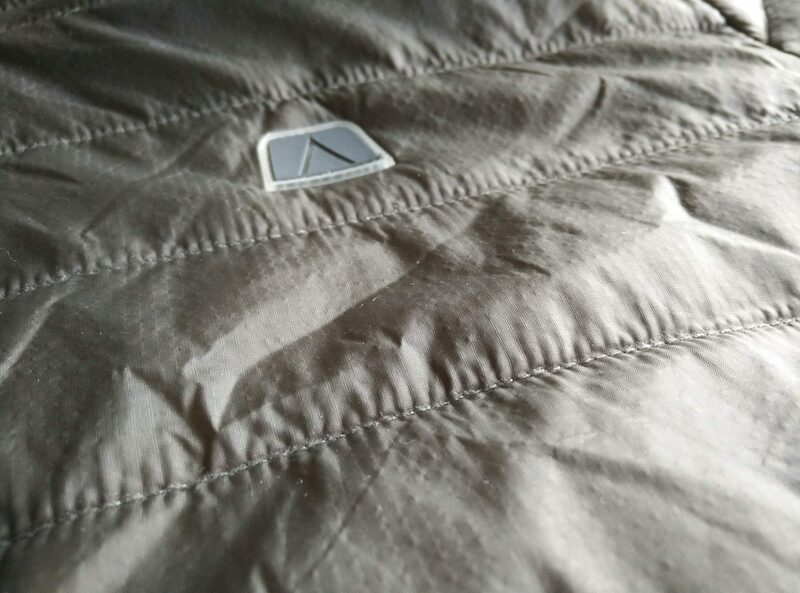 If you do venture out in rainy weather with either a fleece jacket or synthetic fill jacket, be aware that especially the latter takes a long time to dry. 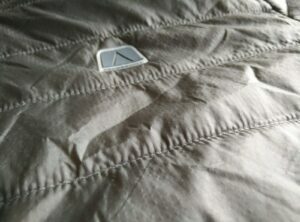 You will typically get soaked faster in a fleece jacket, but it will also dry faster due to the airy and porous structure of the fleece fabric. Even though the latest fleece fabrics such as the Polartec High Loft compress very well, they still don’t match synthetic fill insulations. If you often undertake long backpacking trips, a jacket with synthetic fill insulation will probably be a better option for you than a fleece jacket. It will pack smaller and thus take up less space in your backpack for the warmth it provides. Many synthetic fill jackets have a pocket that doubles as a stuff sack which is very convenient – you don’t have to compress the jacket between other things in your backpack to pack it small. 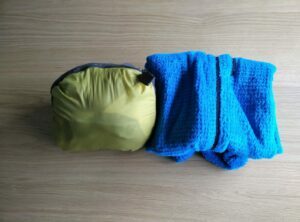 These convertible stuff sacks often feature a carabiner loop so you can attach the packed jacket to your climbing harness or backpack to avoid taking up space inside your pack. 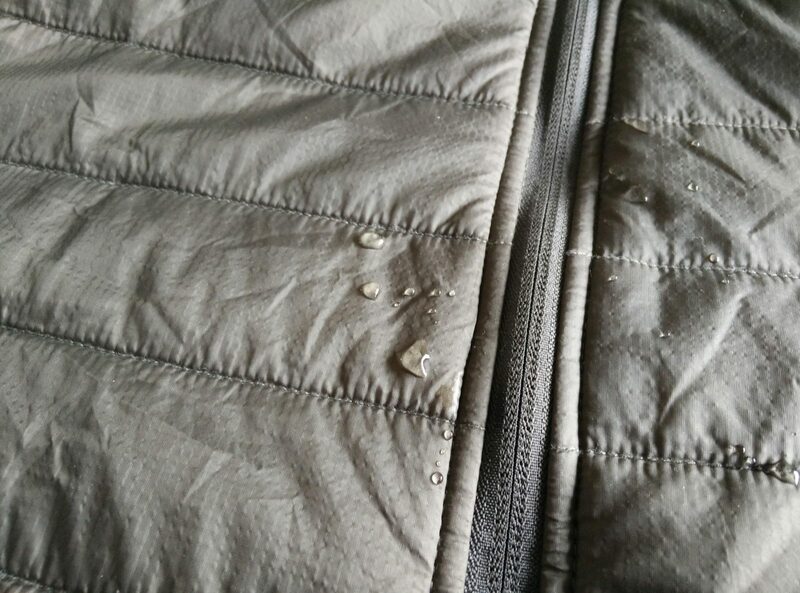 Jackets with synthetic fill insulation are not as durable as fleece jackets because they usually have a very thin face fabric (to be lightweight). 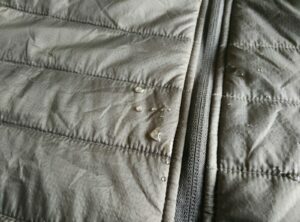 In case that the face fabric gets a tear, the delicate insulation will soon start flying out of the jacket. Therefore, such jackets are not the best option for hiking in dense woods where you might tear a hole in the fabric. The thin face fabric is also hard to sew. That’s not the case with fleece jackets. So, if you often hike in dense bushy or forested areas, a fleece jacket is a better option for you. Fleece jackets can also withstand more washings. When it comes to price, synthetic jackets are in general more expensive. However, high-quality fleece jackets that use sophisticated materials such as the Polartec High Loft are not much cheaper than synthetic fill jackets. If you have to choose between purchasing one or the other garment, you should base it on your needs – and not on the price. So, should you buy a fleece jacket or a synthetic fill jacket? If you need a jacket for winter conditions, a synthetic fill jacket is the obvious choice, because a fleece jackets won’t provide enough warmth. For spring and fall, however, a fleece jacket is a better option unless you often do long backpacking trips (synthetic jackets pack smaller) or hike in very windy conditions and don’t have a wind-resistant garment to put over. I’d love to hear about your thoughts on fleece jackets and synthetic fill jackets. Write them in the comments section below.